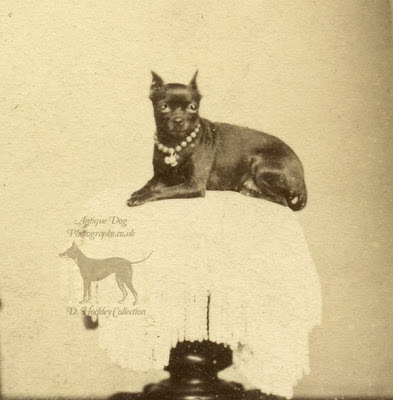 This is a portrait of a Black and Tan (or English Toy Terrier). Before the formation of the Kennel Club in England, Black and Tan's were used in rat pit. 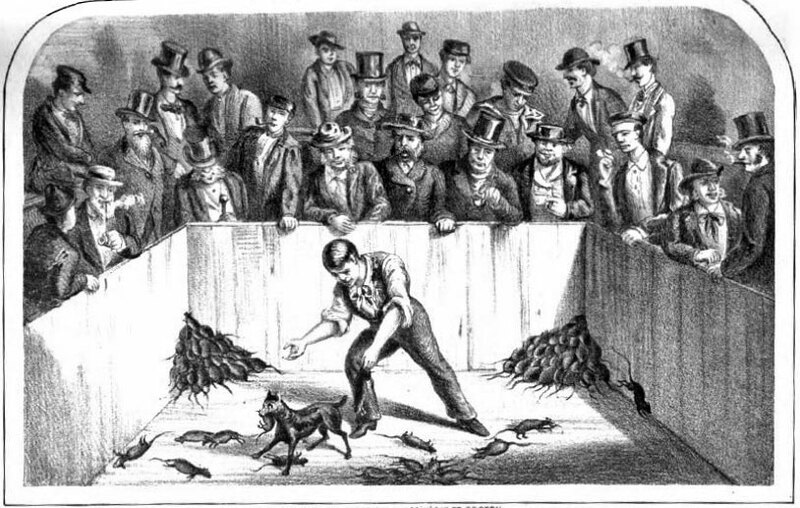 In this sport, men would bet on the number of rats, and the speed at which the dog would be able to kill them. One of the smallest and most famous ratters was 5lb "Tiny" who is said to have killed 100 rats in just over 5 minutes. The black-and-tan English terrier is a very elegant dog, approaching in his symmetry to the greyhound. Skull flat and narrow; eye small and dark; nose black. The ears, if cropped, should be erect, long, and tapering to a fine point. 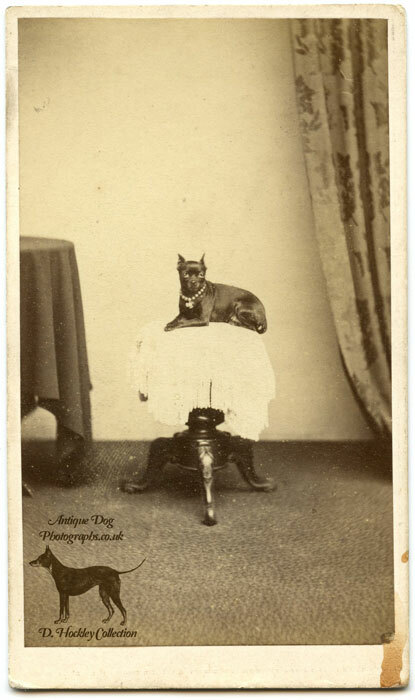 The photographer Henry Death, has taken great care with his subject to create contrast between the dark, shiny coat of the dog and the paler, plain backdrop. This effect creates a simple but startling portrait. Henry Death was born on 31st of July 1820 son of Alice and William Death in Molton, Cambridgeshire. He married Frances Ann, and together they had four sons and three daughters. 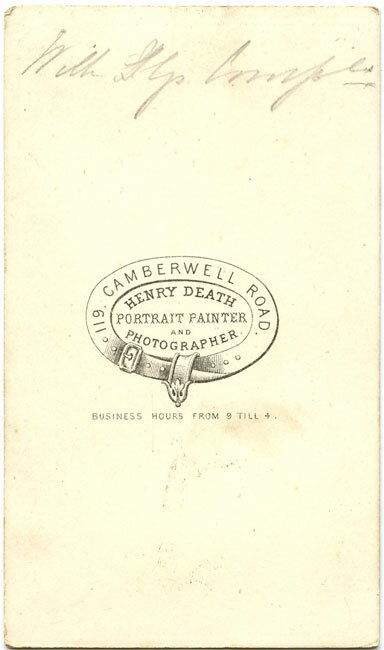 Death started his photographic career in 1856, opening a studio in the family home at 5 Addington Place, Camberwell Road, London. The family resided there until July 16th 1863 when they moved to 119 Camberwell Road where the Black and Tan terrier had his portrait painted. The house & studio was put up for sale in September 1887, because of Death's ill health. Death died in 1900 after a short retirement from photography. We can therefore date the photograph in question to between 1863 and 1887, judging by the simple style of the mount I would date it to the earlier part of this period. 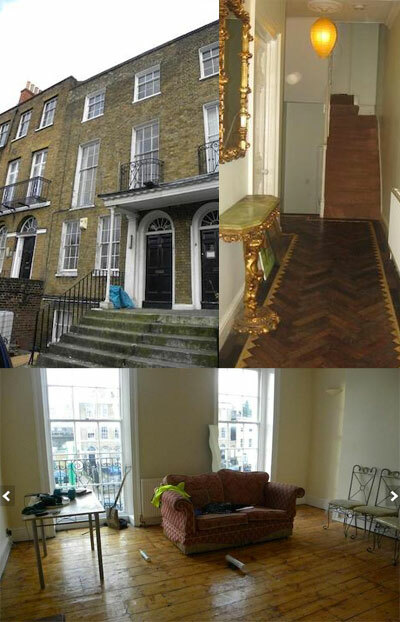 Below is a photograph of 119 Camberwell Road as it is today, the interior retains some of the period features, such as the decorative wooden flooring, which would have been there when it was the home of the Death family.